Welcome to Day #5 of Cacao Nibs Theme Week. Today's Smoked Salt Super Dark 80% Cacao bar was from Vosges IP, LLC (Chicago, IL). This bittersweet chocolate bar had a pleasant subtle chocolate aroma. 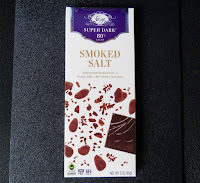 It was smooth and even for an ultra-dark bar, and was suffused with a subtle, even touch of Alderwood smoked salt from the Pacific Northwest. 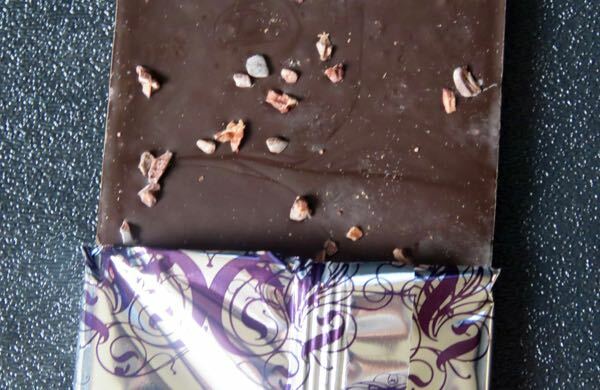 A light smattering of cacao nibs from Ghana on one side provided additional, authentic chocolate flavor depth—more than I remember tasting with other Vosges bars (that would have had more sugar and no nibs). 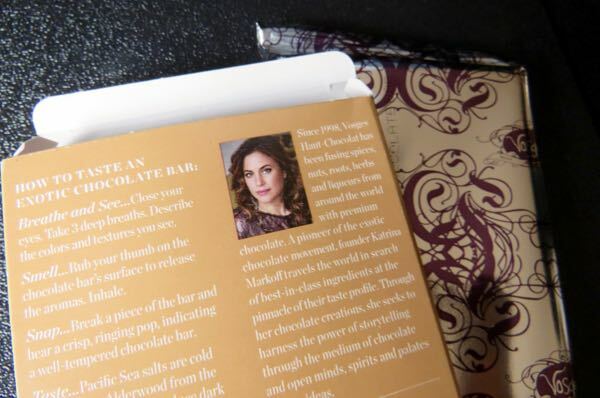 Vosges started producing chocolate in 1998; and Katrina Markoff, Vosges founder and the brand behind the Vosges brand, seems to exude creative sophistication, as does the packaging for her bars and confections.